Rewards Canada: October 7 Update:Enter to win a $100 Gas Card! Enter to win a $100 Gas Card! Did you see our post earlier today for your chance to win a $100 Gas Card? 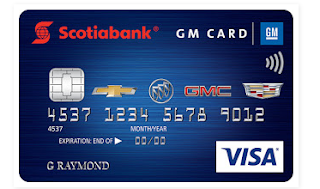 Simply talk to us about the new Scotia GM cards for a chance to win! Find out more here. Have you voted yet for your favourite travel rewards credit card? 2,500 others have already done so! If you haven't voted yet be sure you make your voice heard! Vote here! Thanks to Rewards Canada reader David for letting us know about the new Tangerine Money Back credit card that will be coming out soon. It provides you with 2% cash back on two categories of your choice (not sure if it is generic like travel and groceries or merchant specific) and then 1% on all other purchases. The card will have no annual fee and if you have a Tangerine Savings account and choose to bank your credit card cash back into that account you'll get a third category for the 2% back. Reminds us of the not-so-succesful American Express Choice cards that were out a few years ago. Learn more about the card here. Talk to us about the Scotiabank GM VISA Suite of Credit Cards for a chance to win a $100 Gas Card!